I’ve lied to you already. If you decide to ride David’s rollercoaster, you’ll be entertained from beginning to end but it’s not all laughs. David drills to the core of adolescent agony and discusses what were, until recently, taboo topics like sexual identity and suicide. He doesn’t shy away from personal tragedy, either. How do you navigate the miasma of everyone else’s expectations? Is it possible to find a comfortable space to be when the world says you don’t fit? Are you responsible for other people’s sadness? 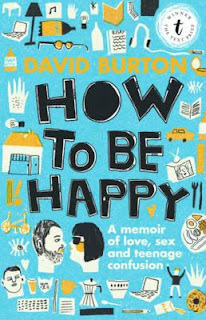 David Burton’s ground-breaking YA memoir is a new niche in the highly sought-after memoir genre: one that I hope will be filled with the many more desperately needed companion titles. How to be Happy: a great read for anyone struggling to find a way through the adolescent murk.